Monday January 11th 1875 A real pleasant morning compared with what we have had. I walked to school and back again today. When I got home supper was ready. I ate my supper and helped Laura wash the dishes. I did up some shirts for Aunty and then worked the rest of the evening on the sacque. Uncle and Ira were both downtown in the evening. Tuesday January 12th 1875 Rather a pleasant morning. I walked to school but in the evening when I came home it was damp and misty. Laura did not come home tonight. I helped Aunty a little about the supper and in the evening did my own ironing. And finished up a letter I began to write at school to Lizzie Lindley, besides sewing a little, was very tired tonight. 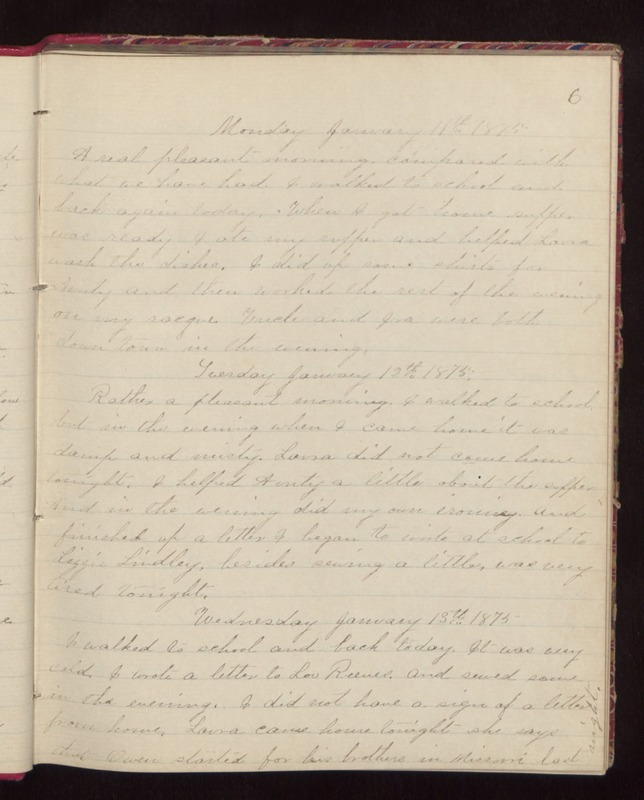 Wednesday January 13th 1875 I walked to school and back today. It was very cold. I wrote a letter to Lou Reeves and sewed some in the evening. I did not have a sign of a letter from home. Laura came home tonight- she says that Owen started for his brothers in Missouri last night.